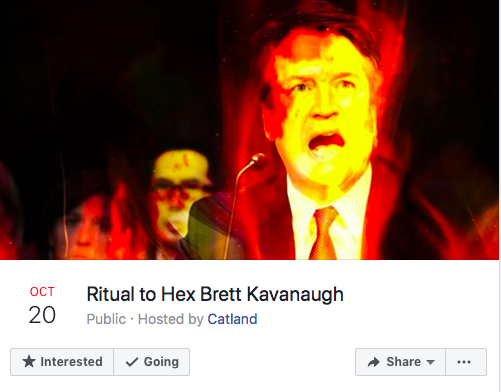 Occultists in Brooklyn are inviting practitioners of witchcraft to place a hex on Supreme Court Justice Brett Kavanaugh and the patriarchy. The group hex is the latest attempt by some to magically “bind” President Donald Trump and his administration. Shortly after the 2017 presidential inauguration, the content of the ritual purportedly used by members of the “#MagicResistance” was published online, according to the BBC. Its author, a self-described “magical thinker” named Michael M. Hughes, recently published a book called “Magic for the Resistance: Rituals and Spells for Change”. Hughes continues to post content online for those hoping to magically frustrate the president’s agenda. Depressed? Angry? Want to feel better? Look at this picture of Donald Trump burning in hell from Saturday night’s #BindTrump ritual.